Just What are Piano Chords? You may have heard of people playing chords and that's led you to ask, “What are piano chords?” Well, go to your piano or keyboard ... then play a C, E, and G together. You have just played a chord. It’s a C chord. So, what are piano chords? So, what are piano chords? A chord is a group of notes - usually 3 or 4. What letters and numbers you see in the chord tells you what notes to play. In the beginning, you can start by learning major chords. They are 3 note chords. They will sound the same as the C chord I mentioned earlier. Major chords are written as just a letter name. For example: F, G, Bb, C#. To play a major chord, you have to skip every other note. With the C chord, we skipped playing D and F. For a G chord, you play the notes G, B, and D. You don’t play A and C.
There are 3 major chords you can play using only the white keys: C, G, and F. With different letter names than these, you need to add in some black keys so that they sound right. For example, you play a D chord by using D, F#, A. Now, try playing an A, C, and E together on the piano. It sounds different than the major chord. It’s a minor chord. There are 3 minor chords that you can play only on the white keys. They are am, dm, and em. Start on the letter written and skip every other note. The small “m” means it’s a minor chord. To find other minor chords, you’ll need to play on some black notes. You can do the same thing as you did with the major keys. Listen to the sound of the chord and try to recreate it starting on a different key. Twice now I’ve mentioned playing black notes – or sharps and flats. One way to figure out which notes to play is by sound. Another way is to memorize chords. I have a page of chord charts. You can look up individual chords there. 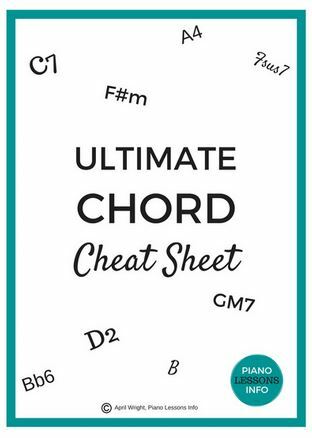 You can also download a free Ultimate Chord Cheat Sheet at the bottom of the page. The third way of learning more about chords is to know the different types and how to make them. You've answered the beginner question of "what are piano chords." Now you can ask the same question but a step higher. You'll be asking, "what are piano chords" in terms of their names and how to build them. There are many different types of chords. It can be a little overwhelming when you see them all there. In a song however, there are usually only a few complicated ones. Knowing the major chords and minor chords will get you far. To learn more about the names of the chords and how to read them, click here: read piano chords . After reading about the different types, you can begin to learn about chord theory and key signatures. Learning how to make chords is really beneficial. Do this by learning some chord theory. Learning it makes for quick playing. Instead of stopping to look up a chord, you can figure it out of the spot. If you’re really interested in learning about chords and being able to play them well, I recommend taking a course called Piano Power Chords. It has 39 lessons (including video lessons) specifically on chords. It's the best chord course out there I think. 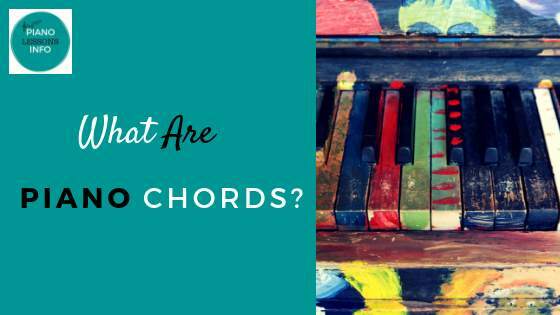 Hopefully I’ve answered the question, “what are piano chords.” Now that you know, you can begin to learn more about them and start playing. Return from What Are Piano Chords to the Piano Lessons Info Homepage.